The appetite to add rigs seems to be waning, as we noted last week, and a new interim peak may be forming. This in turn suggests the breakeven price to add oil rigs is rising to about $60 / barrel WTI, up from around $48 / barrel a year ago. Oil prices recovered on the OPEC deal – no surprise – but seem weak again today. The Brent spread has closed to $6 / barrel, with weakness in Brent. Not clear what it means, but we would expect to see this if supply overruns demand. Too soon to make a call, though. Since last July’s peak, 90 of the 105 horizontal oil rigs additions have been in the Permian; 12 in the Cana Woodford—and even the Cana Woodford is no higher than in November. All other plays have added a mere three rigs since last July. Equities have continued to move up, with our benchmark, the Williston Fund, up by 15% since April 10th. Equities still look to have running room ahead of them for the next three weeks. When oil is cheap and oil spend is less than 2.5% of world GDP, the global economy tends to grow at a solid pace. When oil consumption exceeds 4.5% of global GDP, the world economy typically faces either recession or stagnation (in the 1970s, 'stagflation', after 2011, 'secular stagnation'). In between, when oil consumption exceeds 2.25%, but is less than 4.5%, of GDP, growth can continue, but oil prices begin to weigh on the economy. Interestingly, oil prices are not stable in this 'no man's land'. That is, the demand-constrained price of oil is 1.75-2.5% of GDP; the supply-constrained price of oil is above 4.5%. The oil price will either fall to the demand-constrained price or rise to the supply-constrained price. There is no stable landing point in between. Oil prices have moved back into 'no man's land' and are no longer cheap. 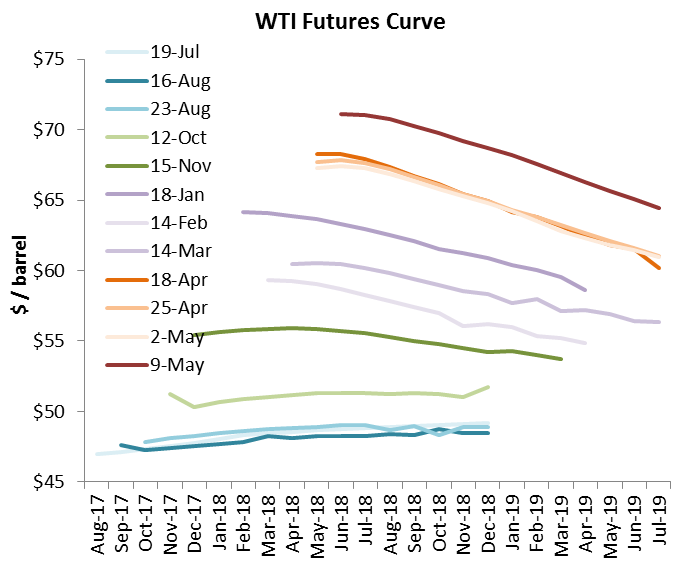 The futures curve still believes oil prices will be demand-constrained in the 2020s, but given the extraordinary dependence of global demand growth on an ever-increasing Permian supply, the odds of it ending badly look high. Our outlook now anticipates that the current business cycle will end in 2021 with oil spend averaging 5.1% of GDP for the year, representing an average price of $138 / barrel on a Brent basis. Whether the price spikes higher depends on whether the advanced economies revert to 'fight' rather than 'flight' mode. In fight mode, as we saw from 2005 to 2008, the advanced economies were willing to enter into a bidding war with China for incremental barrels, a contest which the advanced economies were destined to lose. This same competition emerged during the Arab Spring in 2011, with oil prices staying high thereafter, but never again reaching the $147 / barrel price seen briefly in 2008. Instead, the advanced economies consistently yielded oil consumption to emerging markets and were ground down in flight mode, with oil generally in the $100-115 / barrel range until the shale revolution tanked oil prices in 2014. On balance, a resumption of grinding oil prices seems more likely, which would take peak oil prices for this cycle (which started in H2 2014) above $130 / barrel, but probably not to the $200 / barrel price we would see were animal spirits to revive in the advanced economies or the global oil supply materially disrupted. We have called for equities to move up, and indeed the Williston Fund, which we use as a benchmark, is up 12% in the last month. Equities still look to have plenty of running room ahead of them. A bullish report this week. 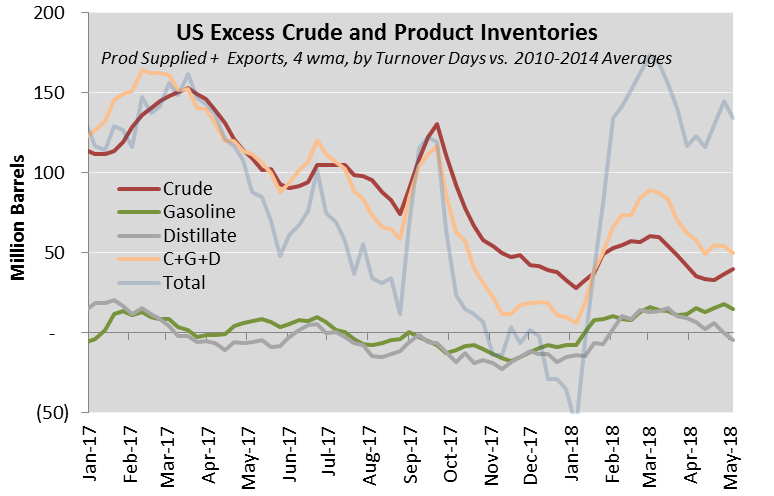 Excess inventories, by turnover days, for CGD were down marginally, but crude was up again. Distillate inventories are tight. The Brent spread, now at $6 / barrel, suggests tremendous demand strength outside the US. Crude and condensate production continues very strong, up 91 kbpd compared to last week. On a 3 mma basis, up at a +1.9 mbpd / year pace; and on a 4 wma basis, +2.3 mbpd / year. •On the same basis, excess GDJ fell 6.8 mb to +5 mb. Distillate and jet are below normal. •Excess CGD was down 4.0 mb to 50 mb by turnover days. The European Central Bank has been criticized for reducing interest rates too slowly during the Great Recession and up to perhaps 2014. In particular, the ECB is blamed for prompting a recession with a 0.5 pp rate rise in 2011, which was reversed a few months later. The Euro Zone suffered one of its longest lasting recessions subsequently. In the broader sense, the data support criticism of the ECB. Compared to the US Federal Reserve, the ECB reacted much more slowly to changing circumstances. Having said that, the world was facing an oil shock resulting from the Arab Spring. Oil spend as a share of GDP from mid-2011 was more than ample to prompt either secular stagnation, as experienced in the US, or outright recession, as seen in Europe. The difference between the US and Europe, of course, was US shale oil production. While Europe was forced to reduce oil consumption to re-balance current accounts, the US was able to achieve a similar effect through import substitution -- by producing its own oil. Thus, while the criticism of the ECB has some merit, the more fundamental problem was an oil shock (really, more a chronic shortage) lasting from 2011 to mid-2014. The Trump administration has declared its intent to lower US corporate tax rates in the hopes of raising GDP growth from the last two years' average of 2.2% to the 3.0% more typical of the US prior to the Great Recession. Would tax cuts actually produce such a result? One way to check is by comparing the US to other OECD countries to see if countries with lower tax rates grow faster. On the graph below, we can see GDP growth rates and corporate tax rates for all OECD member countries, and this indeed does show that growth declines with an increasing tax load. In fact, GDP growth, for a best fit linear trend, declines by 1.3% (pp) for each 10 percentage points increase in the tax rate. Thus, corporate taxation and growth would appear to be linked. The above graph includes the countries listed below. Note that a number of countries in the OECD are either small with unique characteristics -- like Luxembourg -- or developing economies like Mexico, Chile, and Turkey. In this group, even though the US has by far the highest tax rate, its growth is absolutely average. A more reasonable analysis might consider only those countries similar to the US, that is, those advanced wealthy economies listed below. We would typically consider these to be the US's peer group. In this cohort. note that the median growth rate is 1.6%, much lower than the US's 2.2%. At the same time, comparable tax rates average 24%, compared to the US's 35%. For peer countries, a lower corporate tax rate has not translated into GDP growth superior to that of the US. If we regress tax rates against GDP growth, we in fact find that a higher tax rate is associated with a higher rate of GDP growth. But not much higher. Each 10 percentage points increase in taxation yields a 0.1% (pp) increase in GDP growth. Effectively nothing, confirmed by an R2 of 0.007. This leads us to conclude that corporate tax rates and GDP growth in the advanced economies are essentially unrelated. Importantly, among the US peer group, only one country -- Sweden -- has managed above 3% growth in the last two years. Ten of the sixteen countries in the group could not even break 2% -- and all of them had lower corporate tax rates than the US. Using an approach based on international comparisons, we are left to conclude that cutting corporate tax rates is unlikely to raise the US GDP growth rate materially, and highly unlikely to raise it to 3.0%. This article was originally published under the title Japan's Demographic Crisis Will Only Get Worse. Here's Why That's Bad News for America in The National Interest. If you want to see the future of the advanced economies, Japan might be a good place to start. Despite full employment, Japan is showing muted wage pressures, minimal GDP growth, low interest rates, and continued high government deficits. How do these seemingly contradictory elements fit together? Are they unique to Japan, or symptoms of a more general malaise? In Japan, demographics are largely responsible. The country is facing an unprecedented meltdown in population. After peaking in 2010 at 128 million, the country’s population has eased back to 126 million and will continue to decline. Its population is set to shrink by 0.4% annually, with the decrease expected to accelerate to 1.0% annually by the 2040s. By 2050, Japan will have 23% fewer citizens. Not since the great plagues of the Middle Ages have we seen population collapse of this magnitude. Nor does it stop in mid-century. Demographers see current trends persisting to the end of the century, when Japan’s population falls to 50 million, only 40% of its all time high. In the medium term, not all age cohorts are similarly affected. Japan’s 65+ age group continues to increase, but interestingly, is already almost at steady state. (The 75+ age group continues to grow until the late 2020s.) Most affected are the 14-and-under and the 15-65 age groups, the latter here being treated as the potential labor force. From 2017 to 2050, the 14-and-under age cohort is forecast to fall by nearly 40%. The workforce (15-65) falls by 34% in the same period. Thus, not only is Japan’s population declining, its workforce is declining much faster than the population as a whole. The loss of workers constrains GDP growth. In essence, the loss of workers offsets productivity gains, such that Japan’s GDP in 2050 will be not materially higher than it is today. Importantly, worker productivity gains are expected to continue at a reasonable pace, about 1.4% per year. The average Japanese worker continues to produce more. That’s not the problem. The problem is that the number of workers declines by 1.2% on average during the forecast period, with greater declines closer to 2050. Working smarter is negated by fewer people working. Thus, we should expect GDP in Japan in the coming decades to be stagnant, with periods of gains alternating with periods of retrenchment, and no visible trend in either direction – much as we have seen for the last fifteen years or so. Importantly, a decline in Japan’s GDP cannot be unambiguously interpreted as a cyclical downturn. It is as likely to be a function of demographics. The key number to watch will be GDP / worker, which will tell us more about the health of the Japanese economy than will GDP in aggregate. Demographics are a key driver of the national budget. Japan has run hefty national budget deficits for the last quarter century. The country’s working age population peaked in the late 1990s, and has been falling since. With a decline in its workforce, Japan’s GDP growth also declined, and this appears in turn to have led to lower domestic interest rates. At the same time, Japan’s elderly population has been soaring. Given fewer workers, more retirees and lower interest rates, the Japanese government decided to load up on debt as the path of least resistance. This is no surprise given the politics of the advanced democracies. Japan started to run sizeable deficits in 1995, and does to this day. These cumulated into a national debt exceeding 200% of GDP, which will continue to grow until peaking at 225% of GDP around 2025 in most the scenarios we examined. To put this in context, the IMF historically considered a debt / GDP ratio of 60% to represent the maximum prudent level. Japan blew through this limit 20 years ago and continues to be able to operate. But for how long? Our analysis suggests that Japan may nevertheless be able to thread the needle. If real spending per dependent can be held flat in real terms, workers accept on-going tax rate increases, and no internal or external shocks hit the economy, then Japan can muddle through. This would stabilize debt / GDP above 200%, but not much less than that. Neither taxpayers nor spending beneficiaries may be happy with this outcome – or almost any set of policies the Japanese government could conjure. In the scenario above, real taxes per taxpayer would rise by 80% over the forecast horizon in an economy not growing at all in aggregate. In addition, the government would have to hold real spending per beneficiary effectively flat for 35 years – and longer, if over-the-horizon projections were to be included. Will Japanese taxpayers, who are already heavily taxed, accept another 15% rise in tax rates? And will beneficiaries accept no real increase in benefits for decades? Will the internal stresses on Japan’s citizens prove manageable, not only for a year or two, but for generations to come? Moreover, because the workforce is declining, government debt per worker will continue to rise in constant dollars over the forecast horizon, from the equivalent of $50,000 in 2000, to $128,000 this year, and rising to $208,000 in 2050, all in a stagnant economy. For purposes of comparison, the equivalent in the US today is about $75,000 federal government debt / person of working age, and the US has higher per capita GDP than does Japan. Even in the best case scenario, the government will require extraordinary and enduring forbearance from the population. Neither taxpayers nor spending beneficiaries can revolt if the government is to remain fiscally viable. Any portion of society – either the ‘makers’ or the ‘takers’ – may find the necessary social compact unacceptable, and may turn to a populist leadership offering easy solutions like debt default, money printing, or any variety of destructive policies which look appealing on the surface, but are counter-productive in practice. Raising tariffs would be an example. Further, Japan’s economy will be vulnerable to external shocks and global credit conditions. Japan may find it increasingly difficult to respond to global recessions, major weather events or earthquakes, and any rise in global interest rates. A one percentage point rise in interest rates would imply an increase in Japan’s government outlays of 2% of GDP (if all debt were re-financed promptly). Without economic growth as a cushion, the adjustment would have to come in short order from increased taxes or reduced spending. On the other hand, not all trends are negative. Unemployment should be minimal throughout the period, and wage gains should be solid. Real estate should be falling in value year after year, increasing the purchasing power of those with jobs. Moreover, older societies – and by 2050, the average Japanese will be well over 50 years of age – are less amenable to revolutionary promises. The fervor of impressionable, unemployed youth will be lacking, and this may stabilize Japan’s society and protect it from various forms of domestic extremism and foreign meddling. The implications for the US are myriad. Over time, Japan’s internal politics may become unstable and more populist. In addition, Tokyo may find itself in a major fiscal crisis. And in all certainty, Japan will have fewer resources, both in men and money, to devote to its defense. In all these cases, Tokyo will be less willing or able to contribute to collective defense with the US, and may as likely require active US support to right its fiscal ship. Nor is Japan the only country with unfavorable demographics. Japan’s fertility rate, at 1.4 children per woman, is only slightly below the OECD average of 1.5. Japan’s problems are unique in their timing and magnitude, in substantial part due to Japan’s reluctance to allow in immigrants. Most OECD countries, however, are unable to replace their own populations. South Korea is even worse than Japan, and Germany is no better. Japan is the canary in the advanced economies’ coal mine. The difference is simply a matter of time. Nor is the US immune. Like Japan, the US now runs structural fiscal deficits, even at the top of the business cycle. These deficits are coming in higher than forecast, just as America’s 65+ age cohort is set to increase by half to 2025. The Obamacare repeal and replace dilemma reflects just this tension. On the one hand, ‘compassionate conservatives’ – and voters – want universal healthcare coverage. On the other hand, the funding for such coverage is not readily available from tax revenues. Thus, the US social safety net appears to be at a turning point, with enormous pressures to solve the problem by resorting to ever-increasing debt. If inflation and interest rates are low, why not borrow more? That’s what they did in Japan. Like Japan, the US may find itself in a trap of unrealistic expectations meeting the reality of a thinning workforce and a slow-growing economy. This is already visible in states like Illinois, New Jersey and Connecticut, which are finding that they are unable to meet the pension promises made in the last thirty years. Within a decade, these pressures may be manifest on a national level, too. Since 1980, the elderly have benefitted at the expense of the unborn. Lives have become longer, healthier and more prosperous, even as education has become unaffordable and families are raising too few children to maintain society’s numbers. At some point, either the trend line turns, or it doesn’t. If fertility rates are to be raised to replacement level, the price may well be greater support of families without increasing taxes (which are paid principally by the working parents of families). Thus, social spending will be redirected from the elderly to the young and unborn at a time of slow economic growth. Today’s young elderly, those in their fifties, may find a vastly more hostile world when they reach their eighties. Conversely, society may continue to exist for the living and birth rates may continue to fall back. The US posted record low fertility this past year, for example. In such an event, society will continue to consume itself, with each passing generation smaller than the previous – exactly the path demographers have forecast for Japan, and not only until 2050, but until 2100. In the last twenty years, it has been customary to refer to Japan’s weak economic performance as a 'lost decade'. Demographics tell us that we are moving well beyond that. Japan is looking at a lost century. It may not be the only advanced economy to suffer such a fate. US automobile fuel efficiency declined for the fifth time since May, according to a report issued by the University of Michigan’s Transportation Research Institute (UMTRI). New car fuel efficiency peaked in August 2014 at 25.8 miles per gallon, and has since fallen to 24.9 mpg for December 2015. During the period of high oil prices, US vehicle mileage was improving as much as 6% per year, and averaging 3-4%. With the collapse of oil prices last summer, the US consumer now prefers larger cars with more powerful engines, resulting in explicit fuel economy declines. Mileage is declining at the pace of 0.8% per year. We anticipate fuel economy to continue to decline at the pace of about 0.1 mpg per quarter. Had oil prices remained elevated, new cars would likely have seen a 4% sales-weighted efficiency gain over the last eighteen months. Weak Brent. Is it supply, or demand? In this article written for CNBC, I review the Bank of England's oil price model, which suggests that weakness in global demand was responsible for 60% of the decline in oil prices since it's recent peak in 2014. China has to be the principal source of demand weakness, and that in turn seems to be driven by an over-valued yuan. Capital Economics, a consultancy, reports this morning (Dec. 7) that capital outflows from China have increased again, apparently on expectations of pending remnibi devaluation. 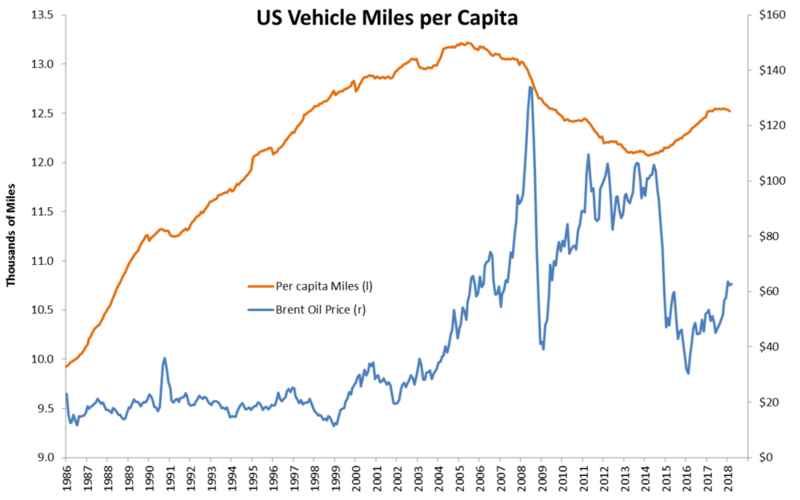 If the BoE model and our interpretation is correct, a RMB devaluation should be bullish for oil, perhaps quite bullish. The importance of horizontal drilling and fracking.